A California woman is suing McDonald's claiming the fast-food giant uses toys to market directly to young children. Monet Parham, a Sacramento, California, mother of two small children filed the lawsuit Wednesday in San Francisco along with health, nutrition and food safety advocates Center for Science in the Public Interest . CSPI is seeking court approval to proceed as a class action. Parham, a 41-year old state employee, says her kids repeatedly ask for Happy Meals, mainly for the toys. "We have to say no to our kids so many times and McDonald's makes that so much harder to do. I object to the fact that McDonald's is getting into my kids' heads without my permission and actually changing what my kids want to eat." Michael Jacobson, CSPI's executive director accused McDonald's of "one of the most insidious marketing practices–dangling a toy in front of a small child." Jacobson called the practice "unfair, deceptive and illegal' in California and many other states. "The food industry has a responsibility not to intrude into families by using sleazy marketing techniques getting kids to pester their parents." Jacobson compared the tactics to tobacco companies marketing to kids with things like Joe Camel. "In this instance, McDonald's is worse. They are going straight at little kids. The company is using unfair techniques to persuade the kids to persuade the parents to go to McDonald's. Tobacco companies don't go after 3 year-olds. Neither does Coca Cola or Pepsi." 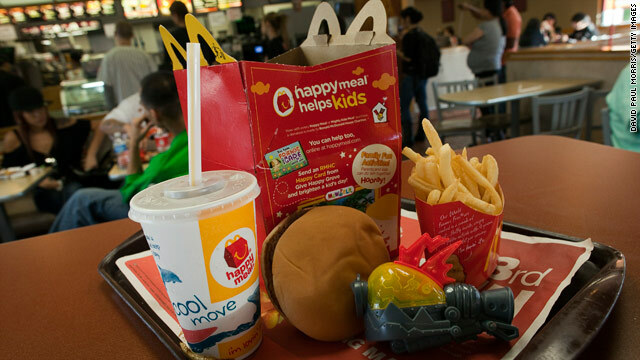 In 2006, fast food companies spent over $520 million on advertising and toys to market kids meals. More than $350 million of that was for toys alone. Last month, The San Francisco Board of Supervisors passed an ordinance that requires happy meals and other fast food offerings with toys meet new nutritional standards or be removed from menus. It goes into effect next December. McDonald's says it is proud of its Happy Meals and will vigorously defend the company's brand, its reputation and its food. "We stand on our 30-year track record of providing a fun experience for kids and families at McDonald's," said Bridget Coffing, a company spokesperson. "We listen to our customers, and parents consistently tell us they approve of our Happy Meals. We are confident that parents understand and appreciate that Happy Meals are a fun treat, with quality, right-sized food choices for their children that can fit into a balanced diet." ﻿This is not the first time CSPI has challenged fast food companies in court. In 2006 the organization went after Kellogg for marketing cereals loaded with sugar to children. In that case CSPI and Kellogg reached a settlement. CSPI also sued Kentucky Fried Chicken for frying its chicken in partially hydrogenated oil, which is high in trans fat. When KFC phased out the oil, CSPI dropped the lawsuit. that type of information written in such a perfect means? Marie Callender's organic cornbread is to die for…. I've used this mix for several years and everyone in my family loves it!! Now, it's sort of a tradition for me and the little ones to have weekly baking sessions with MC’s cornbreads and muffins. You should visit their website today http://www.mccornbread.com to purchase your mixes. I’m sure you will enjoy the great taste! In studying the Lew Archer novels of Ross Macdonald I’ve tried to identify certain characteristics, themes, motifs, images – call them what you like – that crop up frequently throughout the various books. I don’t claim that the following are particularly important or have any special significance or meaning; nor do I say this is a comprehensive list. They are simply some things I’ve noticed in more than one of the novels. Some of these appear in quite a few of the Archers. In time I hope to post the results of reading through each of the books individually while searching for these ‘repeaters’. Thank you for another great article. Where else could anyone get that type of info in such a perfect way of writing? I have a presentation next week, and I'm on the look for such info. Hey, You have done an admirable job. I most certainly will obviously digg it and actually recommend to my buddies. Most likely they will be benefited from this great site. you are a real good webmaster. The web site loading speed is impressive. It seems that your are performing any one of a kind trick. Likewise, The contents are masterpiece. you have done a fantastic job with this topic!